Here’s a good news to all gadgeters and music lovers, Sun Cellular’s latest music store SunTraxx is giving away a brand new tablet. If you think you can’t live without music just head to Sun Music store and create your never ending playlist by simply clicking the register button. 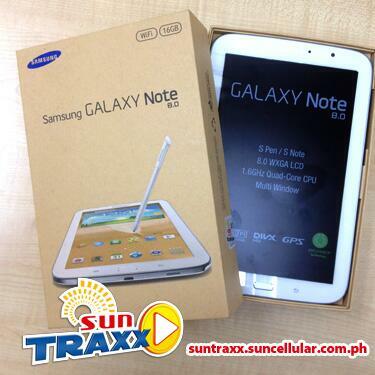 Aside from that playlist thing, Sun Traxx is also giving you a chance to win a Samsung Galaxy Note 8.0 tablet. Quiet easy huh? Try your luck folks, we do not know you will be the lucky winner to own this free gadget. You can also tell you friends about it by sharing this to you social networking accounts. You can also buy and download latest songs from your favorite artist and bands right from your phone or desktop.